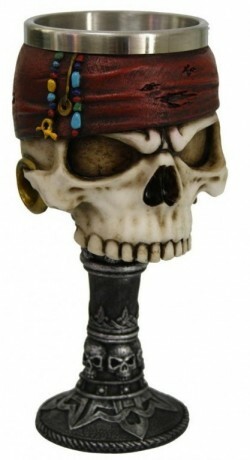 Well detailed goblet featuring pirate skull design. Very nice detail indeed. High-grade resin goblet with a stainless steel inner. Only the inner stainless steel container can be washed normally. The outer resin container can be cleaned with a damp cloth. From the quality Nemesis Now range. April 2018 release.